Brushing with Charcoal Products - Mark T. Albers, D.D.S. Do Charcoal Products Clean and Whiten Teeth? Recent news articles have highlighted a new trend sweeping the dental world – brushing with charcoal products. An example is an August 13, 2018 article in the Wall Street Journal titled, “The Latest Fad for Whiter Teeth Is to Turn Them Black.” A search on YouTube shows multiple videos of people brushing with charcoal, with one video having over 2.5 million views! As dental providers, though, we are more interested in data than faddish trends. Our question, always, is whether a product performs as claimed in a way that is safe for your teeth. You can think of a tooth as having basically three layers. First is the outside layer, or enamel – the hardest substance in your body. Enamel covers and protects the dentin of the tooth. The dentin layer covers the tooth’s soft tissue, including blood vessels and nerve tissue. Dentists want to keep your tooth enamel strong to help protect the health of your teeth. 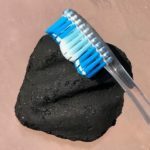 When you brush with products that have abrasive qualities, such as charcoal, you can wear away the enamel, in extreme cases, down to the dentin. Conclusions: The results of this literature review showed insufficient clinical and laboratory data to substantiate the safety and efficacy claims of charcoal and charcoal-based dentifrices. Larger-scale and well-designed studies are needed to establish conclusive evidence. Practical Implications: Dental clinicians should advise their patients to be cautious when using charcoal and charcoal-based dentifrices with unproven claims of efficacy and safety. How Do Consumers Make Informed Dental Decisions? A good place to start with questions is your dental provider’s office. At Mark T. Albers, DDS, our experienced staff stays up-to-date with dental trends and can answer most questions you have. Because there is no good evidence to show charcoal products are safe and effective, and because they can be abrasive to your enamel, we do not recommend their use at this time. As noted above, our dental professionals are happy to answer dental related questions. And, if we’re not available, remember this: When in doubt, don’t try it out!